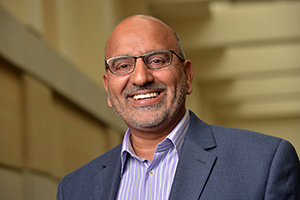 With a $1.2 million grant from the John Templeton Foundation, Ebrahim Moosa, professor of Islamic studies at the University of Notre Dame, has launched a three-year project to enrich scientific and theological literacy among recent graduates of Islamic seminaries in India. Working with scholars and teachers at Notre Dame and in India, Moosa will develop a curriculum and online learning program that integrates modern and classical knowledge traditions for young orthodox seminarians in India. The teaching team will recruit and train 100 recent madrasa graduates who are eager to acquire scientific knowledge that is indigenous to the Muslim tradition and interested in exposure to comparative theologies and modern humanities and social sciences. Moosa joined the Notre Dame faculty in fall 2014 after spending 13 years in the Department of Religious Studies at Duke University. He holds appointments in the Kroc Institute for International Peace Studies and the Department of History. He is co-director of Contending Modernities, a global research project focused on Catholic, Muslim and secular forces in the modern world. His 2015 book, “What Is a Madrasa?” draws on his extensive scholarship on Islamic seminaries in South Asia as well as his own years as a madrasa student in India. Originally published by Joan Fallon at news.nd.edu on April 25, 2016.